Editor's Note: Passionate baseball fan Mitchell B. ('16) has long been curious about the effects of baseball parks on the results of the game, so he decided to use math to get some answers. Ah baseball, America’s favorite pastime, played in little leagues throughout America; it is a focal point in many children’s upbringings. When Opening Day finally arrives, the game is celebrated all around the country as many Americans swarm to their local ballparks. 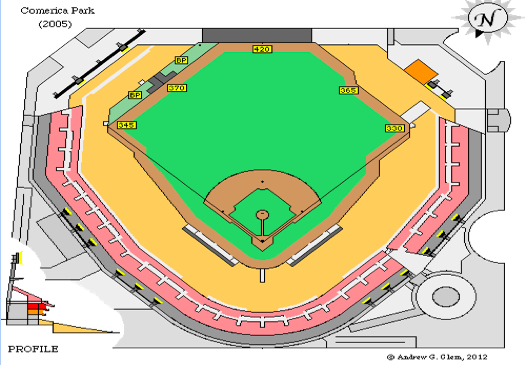 Oddly, not all ballparks are configured the same and therefore, some parks are easier to get hits in than others. This study uses 14 of 15 American League ballparks to quantify which ballparks are more conducive to hitting. The goal of a baseball game is to score more runs than the other team over the course of nine innings (chances for teams to score). During an inning, a batting team will have at least three attempts to get on base. Unless that attempt ends in a walk (when a pitcher throws the ball four times out of the strike zone and the batter is allowed to go to first base), that attempt is called an “at bat”. An inning is over once the fielding team records three outs. An out can be made in many ways: by throwing the ball to a base that a runner is forced to go to before the runner arrives, by catching a ball hit in the air before it hits the ground, or pitching the ball past the hitter for three strikes (which can be achieved by swinging and missing the ball, hitting the ball out of the field of play, or not swinging when the ball is in the strike zone), this is called a strikeout. Teams most commonly score runs by putting together strings of hits, a statistic defined by Major League Baseball Rules as follows, when “the batter reaches first base (or any succeeding base) safely on a fair ball that settles on the ground, that touches a fence before being touched by a fielder or that clears a fence… the batter [must reach] first base safely on a fair ball hit with such force… that any fielder attempting to make a play with the ball has no opportunity to do so.” If a given ballpark’s configuration enables batters to make more hits, then it would be easier to score runs in those ballparks. outs out of the denominator, this metric is isolating how often balls put in play turned into hits. 50 American League average players (as defined by the average batting average of that year) were used from seasons 2010-2014 (10 players per year) to provide a small sample of how the league as a whole performed in specific ballparks. 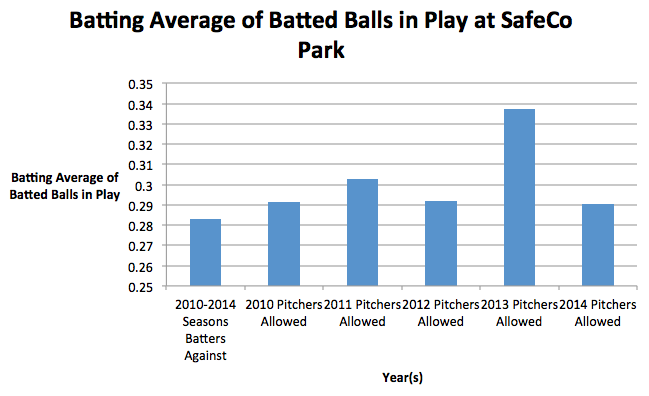 The data from players who were hitting in their own teams’ parks was not included in the statistic for that park because the familiarity of home parks provides an edge commonly referred to as the “home team advantage.” Each player’s at bats, hits, and strikeouts were compiled to create the statistic for each park. The players and season used were: Trevor Pluoffe (2013, 2014), Derek Jeter (2010, 2014), Austin Jackson (2014), Brett Gardner (2011, 2014), Josh Donaldson (2014), Evan Longoria (2014), Omar Infante (2014), Alejandro De Aza (2014), Jed Lowrie (2014), Coco Crisp (2012, 2014), Jose Bautista (2010, 2013), Jus­tin Morneau (2013), Alberto Callaspo (2010, 2012, 2013), Nate McLouth (2013), Yunel Escobar (2012, 2013), Brandon Moss (2013), Desmond Jennings (2013), Josh Hamilton (2013), Ryan Doumit (2013), Nelson Cruz (2012), Kyle Seager (2012), Jason Kipnis (2012), Ian Kinsler (2011, 2012), Dayan Viciedo (2012), Carlos Santana (2012), Mark Teixeira (2010, 2012), Matt Wieters (2011), Johnny Damon (2011), Nick Swisher (2011), Mitch Moreland (2011), Kevin Youkilis (2011), Carl Crawford (2011), Mark Trumbo (2011), Alcides Escobar (2011), Orlando Hudson (2010), Elvis Andrus (2010), Denard Span (2010), Chone Figgins (2010), Yuniesky Betancourt (2010), and Brennan Boesch (2010). Further, to compare how pitchers from the home team performed in their ballparks with how opposing hitters performed in those same parks, batting average of batted balls in play was used in each year that was studied. 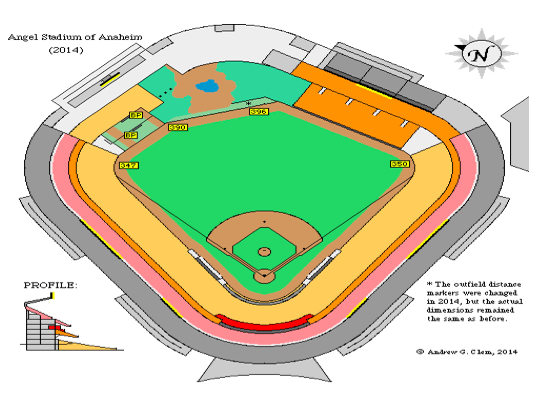 Although the Houston Astros are currently an American League team, their ballpark was not included because it has been an American League ballpark for two years, not long enough to prove a reliable data set. Parks are ordered from least hitter friendly (lowest batting average of batted balls in play), to most hitter friendly (highest batting average of batted balls in play). 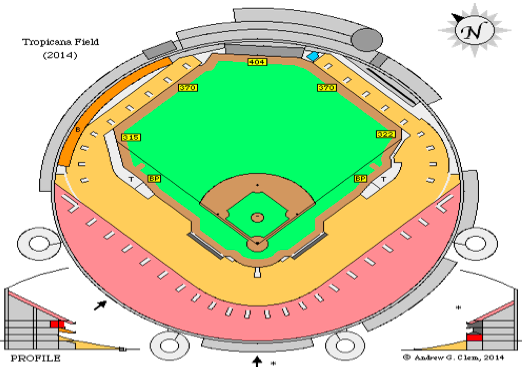 I hypothesize that pitcher friendly parks will have more foul ball territory (part of the field where the fielders can catch the ball in play, resulting in an out), because this would result in more pop outs (balls that are hit almost directly in the air and are known to be easy outs). Whereas in stadiums with less foul ball territory, the ball might go out of play (into the stands), and the hitter would have another chance to hit the ball. 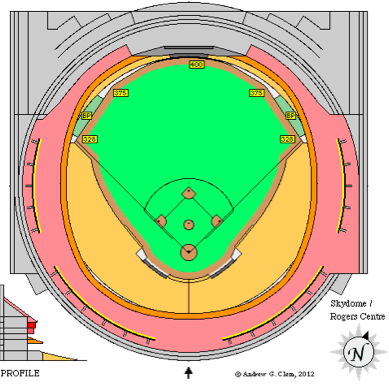 Also, ballparks with larger outfield dimensions would be less conducive to hitting because hits that could be homeruns (hits that go out of the ballpark), would be outs. Home to the perennially poor hitting Seattle Mariners, SafeCo Park is a pitcher’s heaven. 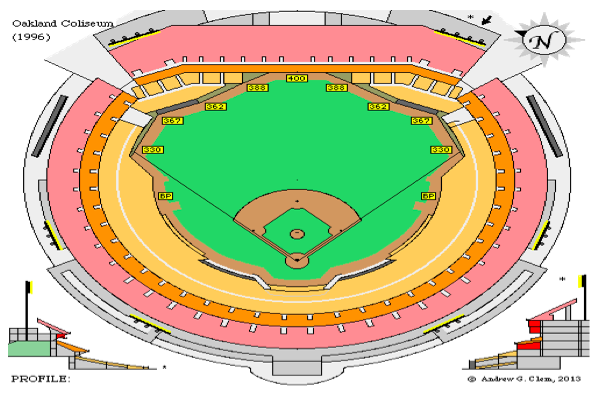 However, its outfield dimensions (to center, left and right field) and foul ball territory are average compared with the rest of the studied stadiums. 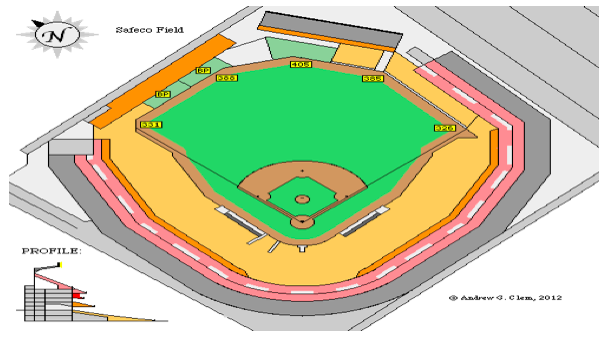 SafeCo Park is a field at sea level, where the air is most dense, leading to greater air resistance, and therefore the ball travels less far than some other stadiums. 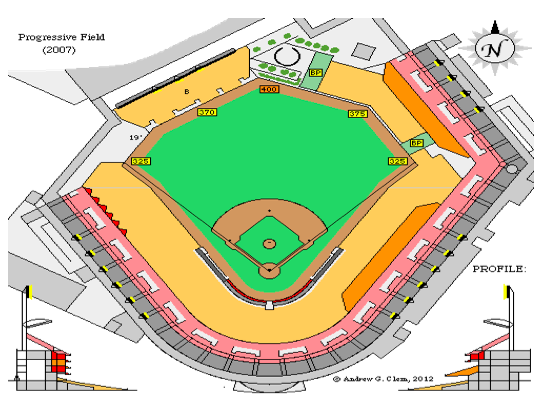 Also, normally most homeruns are hit to right center and left center field, which are known as the power alleys. The power alleys at SafeCo Park are much further from home plate than most other parks, in other stadiums most power alleys are about 350 feet from home and SafeCo Park’s are near 390 feet from home. In 2013, Seattle pitchers allowed a high .337273 batting average of batted balls in play, 5% higher than the average allowed in the other stadiums over the five studied years. Despite normally sporting a stellar pitching staff, led by Felix Hernandez (AKA King Felix), the Mariners were the third worst team in the American League in team Earned Run Average (ERA), the average amount of runs earned by pitchers over nine innings. This anomaly should be attributed to a great number of injuries amongst their pitching staff; they only had four starting pitchers (rather than five) that played on a consistent basis, therefore requiring them to use lower quality players every five games. Oakland Coliseum, Oakland, California. Batting average of batted balls in play: .283582. Star of Michael Lewis’ bestselling book Money Ball, Billy Beane’s Oakland Athletics (colloquially known as the A’s) play in a gigantic ballpark. 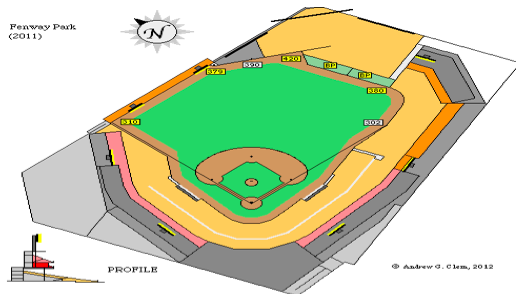 Visually, the foul ball territory in the park is enormous, but it is also by far the largest in the entire major leagues, producing over 120 more foul outs per year than any other park in the major leagues. Pitchers who have a particularly high infield fly ball rate (IFFB), should have great success in Oakland, for pop ups that would be fouls out of play in other parks could easily be caught in Oakland. The power alleys in Oakland are not as deep as Seattle’s, so power hitters do have some luck in Oakland. For example, Oakland has produced at least one top twenty homerun hitter in each of the last four seasons. 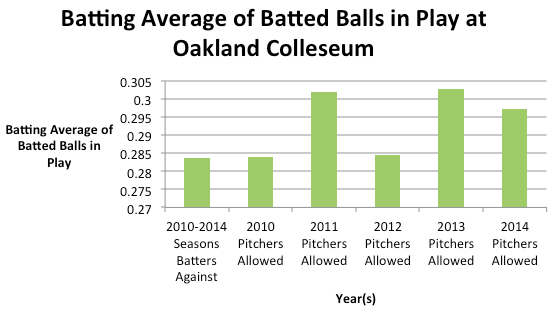 In 2013, Oakland’s starting pitchers produced a .302829 batting average of batted balls in play, about 2% higher than the average of the studied years. This is not indicative of a poor year for Oakland pitchers, for they were second in the American League in ERA, and opposing batting average. In this case, a difference of merely 2% is not enough to dictate a major anomaly in Oakland’s pitching. Yankee Stadium, Bronx, New York. Batting average of batted balls in play: .291743. The new, opulent Yankee Stadium is one of my least favorite ballparks in the Major Leagues; it rids the sport of the nostalgia that makes it so beautiful. Right handed hitters would tend to agree with me, as the power alley to left field is an incredible 430 feet. Although left handed hitters that pull the ball (hit the ball in the direction that they bat, so a left handed hitter that pulls the ball, would hit the ball to right) have a lot of fun with the short porch in right field (the short distance to right, that’s how Curtis Granderson, a Yankee contact hitter, put up 40 homeruns), the park is very unkind. 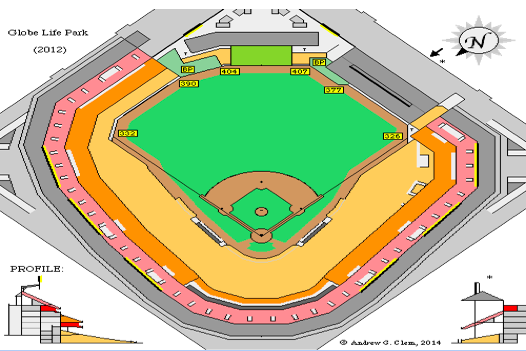 Coupled with the large foul ball space behind home plate, Yankee Stadium produces a confluence of difficulties for hitters. Considering the boon the short fence provides, the Yankees have stacked their lineup with seven left handed hitters! In 2013, the Yankees pitchers allowed a .344843 batting average of batted balls in play, .0531 higher than the average produced by the studied hitters. In 2013, the Yankees had a middle of the pack pitching staff in terms of ERA, however they allowed the third highest opposing batting average in the Major Leagues, meaning that the pitching staff allowed a lot of hits but somehow did not let those base runners score. That is statistically uncommon for often times hits allowed corresponds with runs allowed. Camden Yards, Baltimore, Maryland. Batting average of batted balls in play: .294118. Formerly the home of baseball great, Cal Ripken Junior, and one of the more aesthetically pleasing and nostalgic parks that baseball has to offer, the Baltimore Orioles (colloquially known as the O’s) play in a pitcher friendly ballpark according to the statistic. Although it is not as kind to pitchers as Oakland or Seattle, Camden Yards has the combination of somewhat deep power alleys and a low altitude that can make long shots not seem so long. This has not deterred some major power hitters, as Orioles’ Chris Davis and Nelson Cruz have led the league in homeruns the past two seasons. Even though the ballpark does not have much total foul ball territory, much of it is behind home plate, which is where most foul outs occur, leading to the ninth highest total foul outs in the league. As the Baltimore pitching staff each year has allowed a significantly higher batting average of batted balls in play at home, the studied players may have fared uncharacteristically poorly in Camden yards. Although the Orioles do not have a phenomenal park for hitters, Camden Yards is not as kind to pitchers as the metric would indicate. Target Field, Minneapolis, Minnesota. Batting average of batted balls in play: .295575. One of the newest stadiums in the Major Leagues, the Minnesota Twins’ Target Field is home to one of the worst teams in all of baseball. Since the recent glory days of Cy Young (a pitching award) candidate Johan Santana, Minnesota’s pitching has consistently been near the bottom of the league for the past four years, despite not having a ballpark particularly conducive to hitting. In a league full of right-handed batters who hit the ball to left field, the 377 foot power alley in left center field does not do hitters any favors. This may be indirectly counteracted by the small foul ball territory, as the Twins are in the bottom third of the Major Leagues in foul outs. 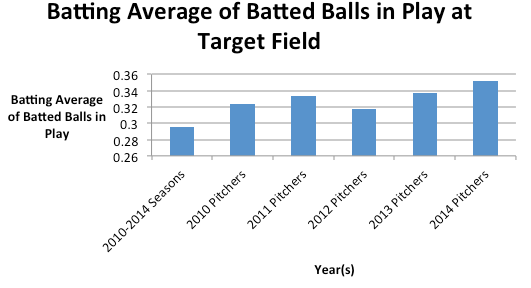 Like Camden Yards, the Twins pitchers allowed a higher batting average of batted balls in play each year, demonstrating that the produced metric over the studied five years may not accurately depict the Target Field’s park effect. In 2014, the Twins pitchers allowed a batting average of batted balls in play of .351272, 6% higher than the studied hitters produced. This makes sense because last year the Twins’ pitching staff had the worst ERA in the Major Leagues. Quite frankly, they were terrible, as for around 34% of their innings were eaten by pitchers with an ERA close to or higher than 5, more than 1 higher than the average American League ERA, 3.8. Kauffman Stadium, Kansas City, Missouri. Batting average of batted balls in play: .298193. One of the greatest Cinderella stories in all of sports, the Kansas City Royals of Kauffman Stadium went to the World Series in 2014 after a 29 year long playoff drought. These lovable no-longer losers’ affinity with their fans was a beautiful sight. After winning a playoff series, star player Eric Hosmer picked up the tab for whoever came to a local bar for an hour. Kansas City sports a very symmetrical park with deep power alleys that rival Seattle. Kansas City, however, is one thousand feet above sea level, where the air is slightly thinner, allowing the ball to travel further. Kansas City is also one of the windiest cities in America, leading to outward blowing winds, which can help carry the ball over the fence. 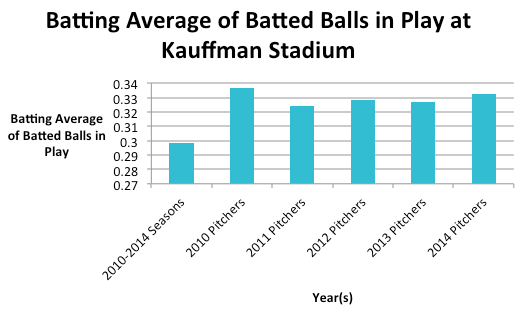 Despite its limited foul ball area, the Royals have caught the fifth most foul outs in the Major Leagues per year. Ultimately Kansas City is a middle of the pack stadium for hitters. Again, however, the rest of the league fared much better against Kansas City pitchers than the studied players; this trend will be discussed in the conclusion. In 2010, the Royals pitching staff allowed a .336829 batting average of batted balls in play, about .038636 higher than the studied five years. In 2010, the Royals had the worst ERA in the major leagues. They did not have a single starting pitcher with an ERA below 4 (which is considered good) in their rotation. They were terrible, for only 17% of their innings were eaten by pitchers with a sub 4 ERA. Rogers Centre, Toronto, Ontario. Batting average of batted balls in play: .301389. The Toronto Blue Jays’ Rogers Centre is the only ballpark in the major leagues with hotel rooms that have a view of the ballpark. This domed stadium is the home of the team with the longest playoff drought in the Major Leagues: 21 years! Despite having somewhat deep power alleys, Toronto has produced a top 10 home run hitter in each of the past five years; this may be attributed to the fair weather that the dome promises. 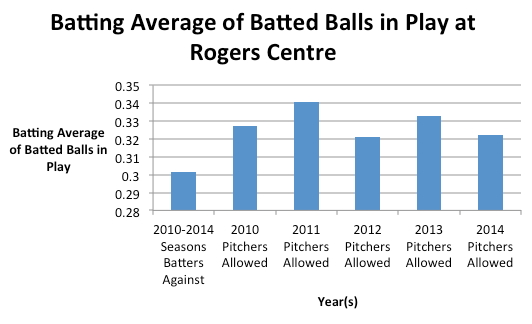 Players who hit for average (rather than for power), however, might struggle with the abundance of foul ball territory that the Rogers Centre provides; the Blue Jays have produced the third most foul ball outs per year in the Major Leagues. Like Oakland, Toronto would be wise to take advantage of their foul ball territory by signing pitchers with a high percentage of IFFB. In 2011, the Blue Jays allowed a batting average of batted balls in play of .340683, .039294 higher than the studied players over 5 years. That year, Toronto had the fourth highest ERA in the American League. Then the Blue Jays dealt with a wealth of injuries, for they had only two starters that pitched most of the season. Their using of poorer players led to this statistical anomaly. Tropicana Field, St. Petersburg, Florida. Batting average of batted balls in play: .308682. The Trop, home of the Tampa Bay Rays is one of the least attended ballparks in all of baseball. 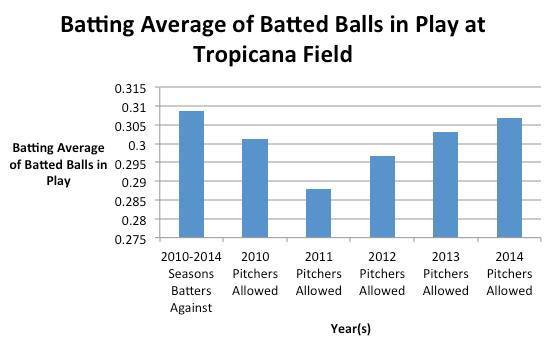 Tropicana Field, under the dome, does not have particularly deep power alleys, which is great for power hitters, as Tampa perennially produces some of the league’s top homerun hitters. 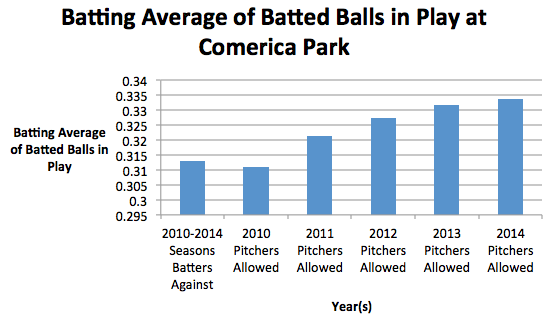 Tampa, however, has a great deal of foul ball territory, and is fourth in the league in foul ball outs per year. Moreover, because of the domed stadium, players may feel a bit more comfortable because they don’t have to deal with the elements. In her book Quiet, Susan Cain found that female basketball players shot better free throw percentages than male basketball players because not as many people were watching. The same may be the same with Tampa because while the park does not seem very hitter friendly, less people attend games and therefore there is less pressure to perform. 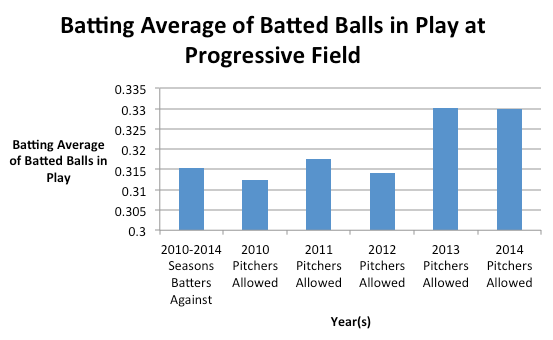 In 2011, pitchers allowed a very low .287837 batting average of batted balls in play, .020845 lower than the average over the five studied years. In 2011, the Rays had the second lowest ERA in the Major Leagues. Led by David Price and James Shields, that year, the Rays were unhittable. Comerica Park, Detroit, Michigan. Batting average of batted balls in play: .312925. In Detroit, one could argue baseball is loved more than many other cities in America. In schools, local lore has it, if kids return the day following opening day with a ticket stub, their absence will be excused. It is said that kids would cut school and wait outside of the ballpark, trying to get peoples ticket stubs: people love their Tigers! Detroit is a hitter’s ballpark, the Tiger have been one of the best hitting teams in the league, but the power alleys are not that deep, leaving pitchers consistently frustrated as hitter’s belt balls out of the park. There is a lot of foul ball space, which creates the sixth most foul outs in the league. Detroit is also one of the windiest cities in America, leading to the ball carrying more easily than in most parks. In 2014, the Tigers pitchers allowed a .333632 batting average of batted balls in play at home, .020707 higher than the average amongst the studied batters. Despite having studs David Price and Max Scherzer, Detroit posted the fifth worst ERA in the American League. This anomaly was due to a poor year from former Cy Young winner and MVP Justin Verlander, delivered a 4.54 ERA. Progressive Field, Cleveland, Ohio. Batting average of batted balls in play: .315457. Progressive Field’s Cleveland Indians, whose manager hilariously dressed as a giant baby in the team’s Harlem Shake video, have a true hitter’s ballpark. In windy Cleveland, the power alleys are deep, but Cleveland’s small foul ball territory yields the Indians’ place as 24th in the league in foul outs, allowing hitters many more chances to get the ball in play. In 2013, the Indians allowed a batting average of batted balls in play of .33012, .014663 higher than the average found from the studied fifty hitters. Cleveland had a middle of the pack ERA in 2013, but struck out a very high amount of batters, leading to a relatively small number of outs made in play. US Cellular Field, Chicago, Illinois. Batting average of batted balls in play: .324451. The Chicago White Sox (a.k.a. the other Chicago team), have a hitter’s park out in the windy city. Although there is a lot of foul ball territory, hitters benefit from low walls and out blowing wind. This park is a power hitter’s dream. In 2014, White Sox pitchers allowed a batting average of batted balls in play of .338937, .014486 higher than the average as demonstrated by the studied hitters. This is because, the White Sox had the third worst ERA in the American League, as pitchers allowed many hits. Angels Stadium of Anaheim, Anaheim, California. Batting average of batted balls in play: .329359. The Los Angeles Angels of Anaheim proudly own the Major League’s clunkiest name! They also account for the largest anomaly in this data set. Angels stadium is a pitchers park. Though they only rank 21st in the league in foul outs created, the power alleys and corners of the outfield are very far from the plate. The 50 hitters used in this data set hit very well in Angels Stadium. The large dimensions of the park may account for the struggles of recently signed sluggers Albert Pujols and Josh Hamilton, who were devastating hitters with their old teams, both of which were in hitter’s parks. Hamilton, actually, had a .33 higher batting average away from home in 2013, his first year on the Angels. Global Life Park in Arlington, Arlington, Texas. Batting average of batted balls in play: .333824. 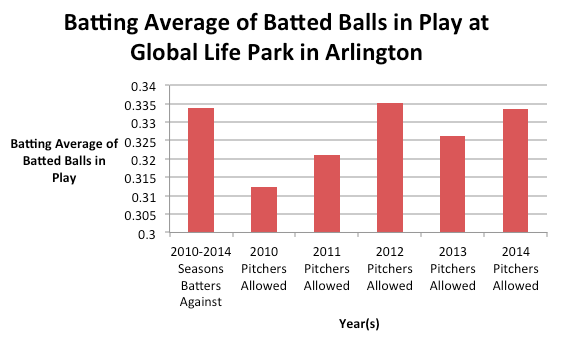 Despite its deep power alleys, the home of the Texas Rangers, Global Life Park is known as a hitter’s park because of its lack of foul ball territory. Hitters have many extended at bats (more chances to hit the ball) in Texas because balls keep escaping the field of play. In 2010, the Rangers pitchers allowed a batting average of batted balls in play of .312334, .02149 lower than the demonstrated average by the selected 50 hitters. In 2010, Rangers pitchers posted the fourth lowest ERA in the American League, which is very impressive considering their hitter’s park. That pitching staff was led by stellar ace C.J. Wilson, and a dominant bullpen, led by Alexi Ogando and Neftali Feliz. Fenway Park, Boston, Massachusetts. Batting average of batted balls in play: .335635. Finally, Fenway Park, home of the Boston Red Sox, the Green Monster, the Fenway Frank, and the curse of Babe Ruth. Fenway is also a ruthless (see what I did there?) park to hitters. Boston is a windy city already, but coupled with little foul ball territory, a 302 foot shot out the right field and that pesky pole (the right field foul pole, a short 302 feet from home plate), and a literal green monster (the large wall in left field) 310 feet away, Fenway Park has a confluence of ways to annoy pitchers and to make hitters careers (how good would David Ortiz be if he played in Seattle?). This is why the 2013 Red Sox should be commended for having the sixth best ERA in the American league. The 2013 World Series winning Red Sox had a bunch of reliable starters and an unhittable bullpen. 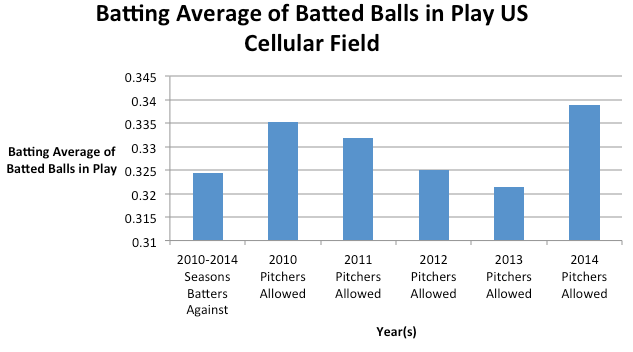 In the end, the metric batting average of balls in play is only somewhat reliable in the manner that it was used when determining ballpark effects. 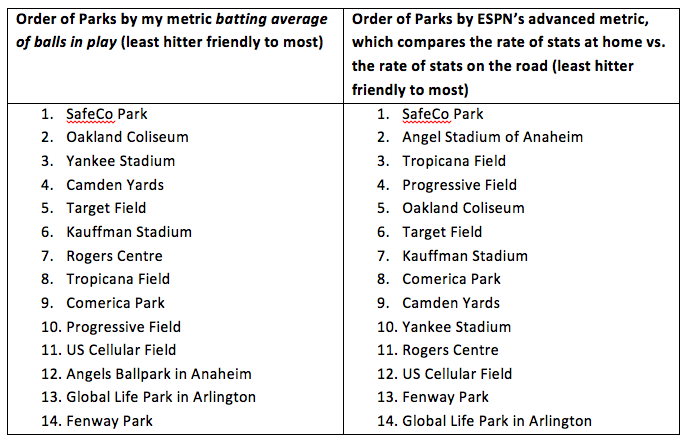 There were two major variations between the results of my metric and that of ESPN, (Yankee Stadium and Angels Ballpark in Anaheim). This may be because a data set of fifty players is too small. If more players were used from more seasons, perhaps more accurate readings could be found. 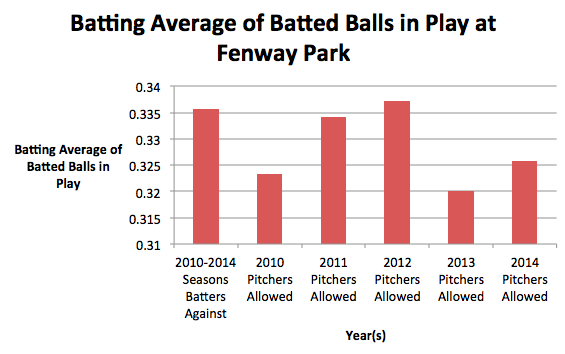 Though, consistently, ballparks that are more conducive to hitting have less foul ball territory and shorter power alleys whereas pitcher’s ballparks tend to have more foul ball territory and deeper power alleys.